These three enormous buildings in midtown are collectively known as the 'XYZ' buildings, each sharing a similar slab-design that maximizes floor area. 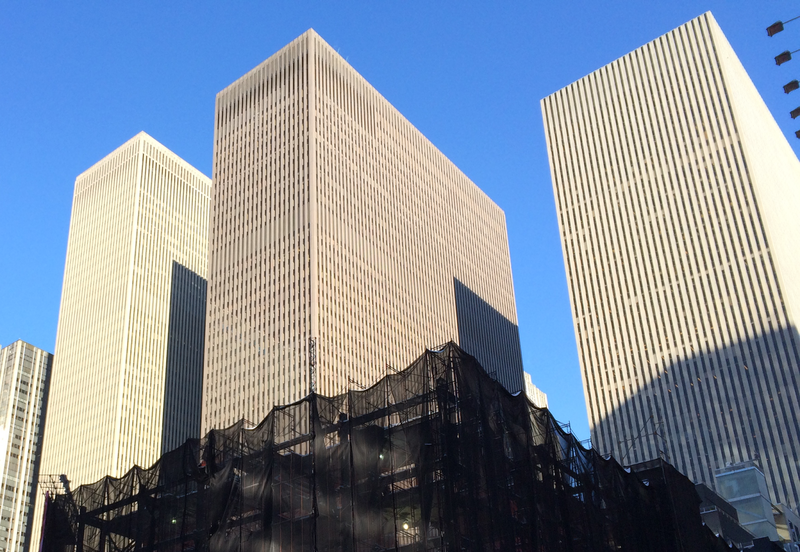 The Exxon Building (1971), McGraw-Hill Building (1969) and Time-Life Building (1958) represent the expansion of Rockefeller Center in the 1960s. Harrison, Abramovitz & Harris was the architectural firm that designed each building. Combined with 1211 Avenue of Americas, which was built in 1973 and also designed by Harrison's firm, these four massive buildings comprise nearly 8.7 million square feet of office and retail space. When standing in Times Square or on Sixth Avenue anywhere from 47th to 49th Street, these buildings project a feeling of commercial power and corporate establishment. The imagery below illustrates these buildings in their midtown context with the background buildings of midtown visible in the last image.